One of my goals this year has been to make carving out quality time with Aaron a priority. We are very lucky to have family in town who are willing (and eager!) to watch Jona for us so that we can have regular date nights. Some months are busier than others, but we try to get out of the house and do something together once a month. We both love to eat and try new restaurants, but often our date night ideas stop there. So I’m always on the lookout for fun date night options that are a little different from the traditional dinner and a movie (because these days, dinner and a movie would turn into dinner and a nap for this tired pregnant lady!). When the folks at The Murder Mystery Co. contacted me to see if I’d be interested in checking out one of their local shows, I jumped at the chance. 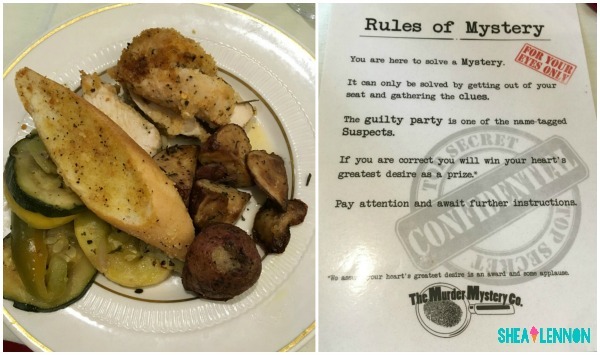 So, what is a murder mystery dinner theater? Basically, it’s part theater production, part interaction, and part dinner. The actors and actresses put on a show, but the audience gets involved in solving the murder mystery. And, because food makes everything better, you get served a delicious dinner in the process. I’ve never experienced anything like it before, but it was such a blast. 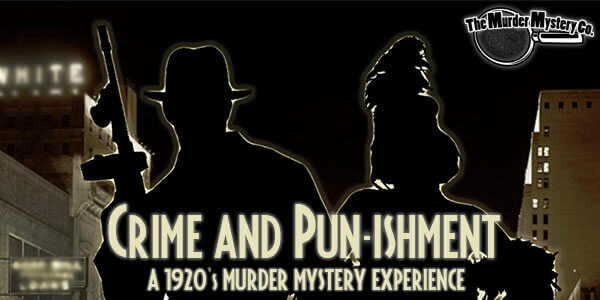 We went to the show Crime and Pun-ishment, set in a 1920s speakeasy, and involved bootleggers, flappers, and organized crime. 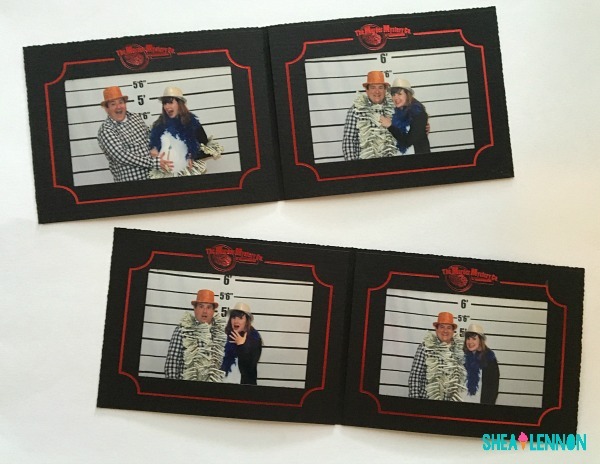 Guests are encouraged to dress the part as well, and we saw lots of people who had a lot of fun with that. That’s really not Aaron’s jam, and since my wardrobe is pretty limited (and honestly, it’s not really my jam either), we just wore regular “date night” attire and felt just fine. We attended the show at a Kansas City country club, and both the food and the venue were fantastic. Having “gold circle” tickets also allowed us to take home fun photo souvenirs, plus have seats with a better view of the show. However, because the show is so interactive, there wasn’t really a bad seat in the house. Aaron and I are both pretty introverted people, so hearing the description that the show is “interactive” scared us both a little. Yet I felt like the atmosphere was really fun and laid-back, and we truly enjoyed ourselves and were thoroughly entertained. We both agreed that we’d do it again! 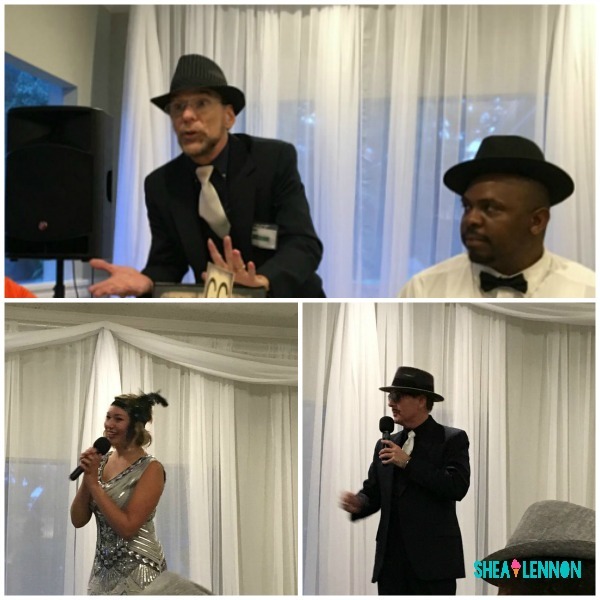 Have you ever attended a murder mystery dinner or something similar? Local readers, be sure to check out the Murder Mystery Company of Kansas City and see what shows they have coming up. It’s an excellent way to shake up your usual date night (or even friend date night!). Disclosure: I was provided complimentary tickets to the show we attended. All opinions are my own.